We interrupt your Sunday of Thanksgiving weekend for a very important blog post. 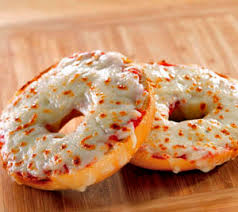 Pizza bagels are delicious. When I was at camp, this was always our favorite meal. While I usually ate pizza bagels traditionally with the bagel, tomato sauce and melted cheese on top, as a kid, there were times when we used ketchup in place of tomato sauce. The result was still a delicious meal. Recently, I made myself a pizza bagel with ketchup and found that at least one person was shocked and a little disgusted by this creation. Therefore, I'm sharing this with the entire world today. Have you ever used ketchup in place of tomato sauce on a pizza bagel? If so, do you agree that they are tasty? If not, would you consider trying it or are you adamantly against this? Earlier this fall, Learned League conducted a 3-week college football mini-league. It was awesome (mostly since I fared well in this category compared with how I do during the "regular season")! Your challenge for this Tuesday as we near the end of college football's regular season is the answer the questions below. 1. Since 2000, two Heisman Trophy winners have been born outside of the United States. Please name either player (and as a bonus that player's country of birth). 2. As of 2015, what school has the only FBS stadium that seats at least 100,000 people that is not in either the Big Ten or Southeastern Conference? 3. What two SEC teams play annually for the Golden Boot, a trophy first awarded in 1996 and named for the shape the two states make when removed from the geographic context of the remainder of the United States? 4. Provide the one element missing from this unordered list: Aggies, Longhorns, Bears, Cougars, Mustangs, Horned Frogs, Red Raiders, Owls, Bobcats, Roadrunners, Mean Green, and [BLANK]. 5. The first college football game broadcast on radio was KDKA's 1921 broadcast of a matchup between Pittsburgh (home of KDKA) and what longtime "Backyard" rival? 6. 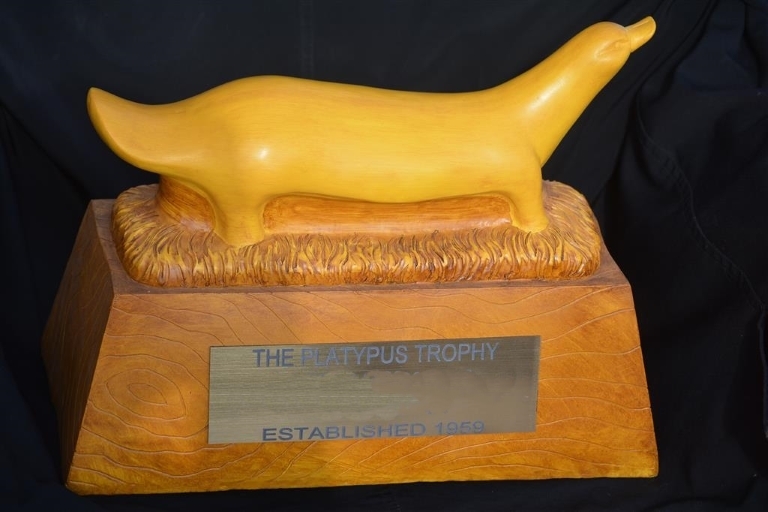 As seen in the redacted image that follows, since 1959, the Platypus Trophy has been awarded to the winner of an intrastate rivalry game. Give EITHER the nickname of that rivalry game or the two schools involved. 7. What player ran for 332 yards in a 45-42 victory over Texas Tech in a 1988 game in Tokyo to set the NCAA's all-time single season record for rushing yards? 8. Which school has won the Commander-in-Chief's Trophy a record 20 times, including being the 2014 winner? 9. Urban Meyer has been the coach for three national championship-winning teams. 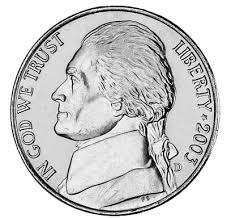 In the 2009 National Championship Game, his starting quarterback was Tim Tebow. Name Meyer's starting quarterbacks in the 2007 and 2015 National Championship Games. 10. Earning roughly $4.6 million in 2015 from buyouts from two previous coaching stops, what man will be one of the ten highest paid college football coaches in the 2015 season without actually coaching a college football team? As always, please leave your answers in the comments section below and don't use the internet (or newspaper, Encyclopedia. etc.) for assistance. Good luck! These questions are courtesy of Learned League. I had my annual physical earlier this week. This seemed like a bigger deal this year because I'm now 40. I thought that a colonoscopy was in my near future, but it turns out that I don't need one of those until I'm 50. Woo Hoo! 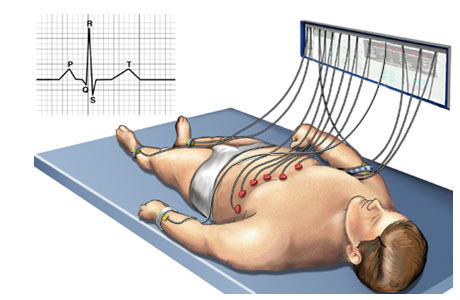 The physical turned out to be no different than any other one with one exception: an EKG. I've never had an EKG before, but it's really quite easy. You lie down on the table and the physician's assistant puts stickers all over your body like this. The difficult part is removing the stickers one the EKG is over, particularly when the stickers are attached to your chest hair. Oh, I also found two stickers by my ankles when I went to sleep 15 hours after the appointment. Anyway, the EKG results were good. My blood pressure and heart rate were also good. My weight was down slightly, and I'm right at where I want to be. Unfortunately, I'm still in the 5' 7" height range, so my growth spurt still hasn't happened yet. Maybe next year! Good again! My cholesterol was significantly higher about 10 years ago, but I've been fine lately. Basically, I'm healthy as a horse. Well, presumably, a healthy horse. You don't want your health to be compared to a sick horse. Based on all of these results, I think I was robbed by People Magazine. Forget David Beckham. I should be People's Sexiest Man Alive! I guess Beckham just has a better publicist. A man was arrested for assault after throwing a sandwich at another man Sunday night, police said. 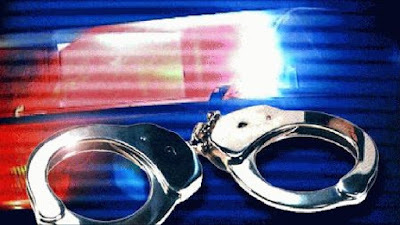 According to the Fairfax City Police Department, 32-year-old Jonathan M. Magnes was transported to an Adult Detention Center and charged with assault and battery, driving under the influence of alcohol, and refusal of a blood and breath test. Magnes threw a sandwich at a 50-year-old man at Firenza Pizza on 10160 Fairfax Boulevard in Fairfax, Virginia. Magnes left the area after the incident and was followed by the man, police said. Police said Magnes was later released and the victim was not injured. Several items here. First, what a waste of a perfectly good sandwich! If you're going to go out to buy a sandwich, why throw it at someone? Next, I like that ABC-7 titles the picture "Police lights with handcuffs (ABC7 file photo)" on its website. Why not just show a picture of a sandwich? Finally, I'm not sure that I can take Firenza Pizza seriously. I believe that the first car I ever drove was my parents' Oldsmobile Firenza. Near the end of its life, the car really struggled to make it up hills. This was a problem in Pittsburgh where hills are unavoidable. I regularly drove on the Parkway East from the Edgewood Swissvale exit toward Monroeville. Despite putting the pedal all the way on the floor, the car struggled to get over 35 miles per hour. The other drivers did not appreciate this. Maybe Magnes also had bad experiences with a Firenza, and this explains why he threw his sandwich at someone! Fairfax Patch also has information about this story. I recently visited Seattle for the second time in my life (this was my first trip) and thought I would share some notes about the trip. - I love the Pike Place Market. Sure, there are aspects that are touristy, but I really enjoy any place where you can buy fresh food and flowers and so much more. It’s just such a neat place to walk around, and yes, I enjoyed seeing fish being thrown. - Besides the original Starbucks in the Pike Place Market, there are seemingly Starbucks on every downtown corner. They really love their Starbucks coffee in Seattle. - Part of the Pike Place Market is the gum wall which will be cleaned for the first time in 20 years this week. Before the cleaning, I took a few pictures. - I found a Steelers bar not far from the hotel where I stayed. I was a little shy when I went in, so I just grabbed a table by myself. A few minutes later, two guys arrived and asked if they could join me. Sure. The one guy just moved from Alaska and wore an Alaska Steelers fan sweatshirt. His friend had a Seattle Seahawks hat on. Over the next few hours, I learned that I had absolutely nothing in common with them. The Alaska guy liked to swear. A lot. Meanwhile, I only seemed to swear when Roethlisberger threw an interception. Discovering that I live in the Washington DC area, he dismissively asked if I work in politics. Um, no. I learned that the guy is seven months sober and that’s part of the reason why he moved to Seattle. He also enjoyed chewing tobacco. As for the Seahawks hat guy, I don’t think I talked to him during the entire game, but I did overhear him telling his friend that he never heard his former girlfriend fart in the four years they were together. - I had my first Uber experience in Seattle. Actually, I got a ride with a friend that has Uber, so I’m not sure if it counts since I still don’t have an Uber app and I didn’t actually pay for the ride. Overall, it seemed like a rather easy process. - I went to a nice restaurant one night for dinner, and the waiter raved about crab cakes and duck as the two dishes that are most popular and are the restaurant’s specialties. Since I don’t eat crabs, I decided to eat duck for the first time in 15 years. It will be at least another 15 years until I eat duck again. - The Space Needle is cool. What is less cool is when the temperature is in the 40s and it is rainy and windy when you get to the top. I think I was only on the outside portion of the Needle for a few minutes since I didn't like being cold and wet. - The Fremont neighborhood was also a cool place to see. - Finally, the Chihuly Garden and Glass wasn’t in Seattle when I visited last, and I’m so glad that I saw it on this trip. His work is incredible. Enjoy some Chihuly pics. Completely unrelated to Seattle, this is my 2600th blog post. That's a ton (+600) posts. Wow! In honor of this tremendous (insane?) achievement, please like Sean's Ramblings on Facebook. Like clockwork, about 90 seconds after I lay down, Ziggy jumps on to the bed and goes under the covers to curl up with me. As I pet him, he purrs happily, readjusts himself to get comfortable and licks my arm. After a few minutes, Ziggy decides that he’s done and will either jump off the bed or move on top of the covers to sleep by my feet. I consider this as quality bonding time between me and Ziggy and a nice way to end the day. Ziggy probably has his own opinion on this ritual, but I don’t have access to what he writes on his own blog to know what he thinks. * Perhaps I am using this phrase incorrectly. Please click here to see previous TMI Thursday posts. Welcome to the latest edition of Sean analyzing song lyrics where I tackle lyrics of some of the biggest current pop songs. I'll take the under. There is no chance Adele called 1,000 times. She must have sent some text or e-mails too. Plus, after maybe 20 or 30 calls, wouldn't you leave a message? I'm sure the person she called has caller ID and would get really upset at seeing hundreds of missed calls. That's probably the point when you change your phone number. I'd like to think that I teach my children values and lessons. Saying please and thank you are important. Not tackling your brother is something we're still working on too. However, one thing that I learned this summer that I hope to instill in my kids is not to be scared of people that are your body type. I'm sorry, but I can't take Justin Bieber asking questions seriously. I mean, this is the guy who was arrested and received probation for throwing eggs at his neighbor. 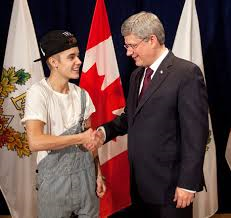 Plus, he wore this when meeting now former Canadian Prime Minister, Stephen Harper. No, I don't know who it is. Oh wait, are you Cali Swag District of Teach Me How To Dougie? No. Are you the Harlem Shake guy? No. Well, I knew Los Del Rio of Macarena fame. Los Del Rio were friends of mine. You're no Los Del Rio. Look, I enjoy listening to pop music. I even like that Justin Bieber song up there. However, this is just a terrible song with terrible lyrics. When I think of this song, I think of the awesome kids' book, The Gruffalo. Why? The Gruffalo features a line that "He has terrible tusks and terrible claws and terrible teeth and terrible jaws." Notice how often terrible is used? Just like this "Marvin Gaye" song. Terrible. Click here to see previous versions of Sean analyzing song lyrics. Many years ago, I was somewhat of a political junkie. I majored in politics, organized a successful voter registration drive in college and had internships with my Congressman and a State Senator. Like many people, though, I got tired of all of the partisan fighting. There is little cooperation between both parties on the national level, and as a result nothing seems to get done. Sure, I still follow elections and the Presidential campaign. And yes, I'm going to vote on Election Day. However, I don't have the passion for politics that I once did and like Pat of Community Matters does. So for the Best of the Burghosphere, I'm proud to award Pat with the Most Likely To Know Your Member of Congress Based on Your Zip Code Award. Pat is a consultant specializing in external, program-oriented projects for progressive nonprofits dedicated to social welfare and justice issues. (Yes, I took that sentence from her website.) She also writes passionately about political issues with resources for lobbying on both the national and local levels. While many of Pat's recent entries focus on national politics, she wants people to get involved. Government is of the people, by the people and for the people, but as citizens, we don't always do enough (look at the voting percentages, particularly in non Presidential elections) or even know enough about how government works. Pat tries to change this by keeping people informed and explaining civics. So due to all of her efforts, Pat has earned the Most Likely To Know Your Member of Congress Based on Your Zip Code Award. 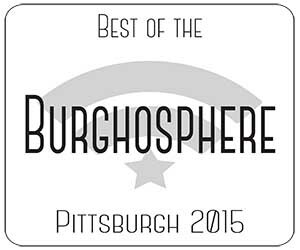 The Best of The Burghosphere is an awards ceremony to honor the creative bloggers in the Pittsburgh region with proceeds benefitting the Most Wanted Fine Art Resident Artists project. The official Awards presentations will be on Friday, November 20, 2015 at 7:00 PM at Most Wanted Fine Art at 5015 Penn Avenue. You can RSVP on this Facebook page. This is a 21+ event. The family friendly party is Sunday, November 20th at 1:00 PM. And yes, there is another Facebook page to RSVP.